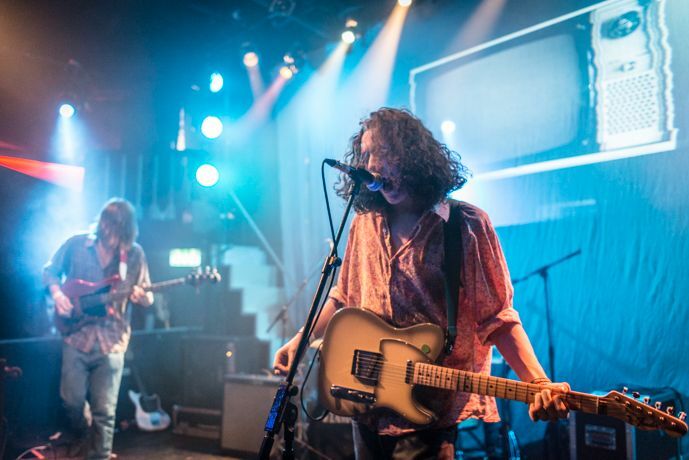 Following a belting performance at FestEVOL, Getintothis’ Adam Lowerson checks out the new release by psych rockers The Floormen. The guitar scene in Liverpool currently feels stronger than it has for a good while. In the past 12 months, a constant stream of solid, adventurous guitar bands have emerged from the city, each with their own unique sound. The likes of Strange Collective and Holy Thursday amongst several others have began to make big waves in the music world, and the strength was certainly on show at last weekend’s FestEVOL, with the Probes and the Vryll Society both demonstrating the depth and variety currently circulating. Another group impressing at the Kazimier event were the Floormen, who having first broke onto the scene around a year ago have continuously developed and honed their sound, and now seem ready to take it up a notch. The three piece’s new track Luna Voluntus, which was revealed following their much talked about performance at the first part of FestEVOL, sees the band at their darkest and most sinister sounding yet. The song is five minutes of haunting guitar riffs, dizzying distortion and snarled vocals, slowly evolving into an intense, kaleidoscopic wig out climax. Where the Floormen’s previous tracks such as The Rabbit On The Wall recall the sounds of Joy Division and dark, 1980s post-punk, Luna Voluntus is their song most rooted in psychedelia. Through the handful of records released by the band in the past year there have been nods to all ends of the psychedelic spectrum from krautrock to shoegaze, but the influence of the likes of the Grateful Dead in this new release is obvious. It creeps along at an eerie pace, the discordant vocal harmonies giving an otherworldly quality while the guitars eventually erupt into a chiming, warped melee with sitar-aping effects giving a 60s-pysch feel. This tune, coupled with their performance at this weekend, shows that these boys are really hitting their stride.